The most common black and brown fuzzy caterpillar is known as the woolly bear caterpillar, which turns into a tiger moth species when mature. You watch this "bear" turn into a "tiger" by keeping one as an insect pet during the larval stage. You need to make sure that certain criteria are in place for the overwinter transformation to occur, but the process is pretty simple and can be quite rewarding. Woolly bears stand out as cute and appealing among moth larvae, and they are safe to handle and observe, according to the Santa Barbara Museum of Natural History. These are among a few nonpest caterpillars, so they're harmless to watch transform. The best time to capture one is October. You can often find one in your garden, lawn or nearby street. This caterpillar moves pretty quickly, so be sure to keep yours safe, preventing the larva from from falling when you reach for the critter. Several tiger moth species make up the Arctiidae taxonomic family. As larvae, they are woolly bear caterpillars. 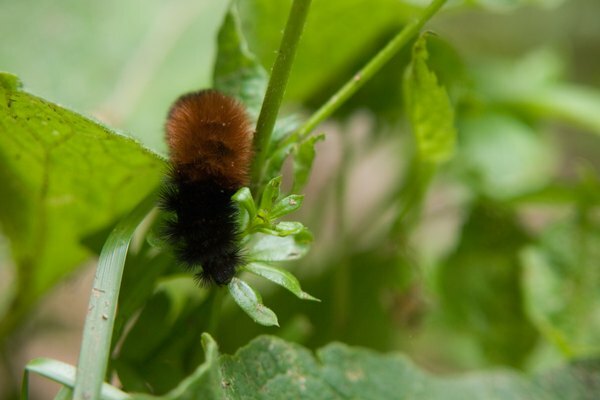 The original black and brown woolly bear made famous by the Old Farmer's Almanac -- the one supposedly able to forecast winter weather, with wider brown bands indicating a milder temperature -- was the larval form of Pyrrharctia isabella, or the Isabella tiger moth. Other tiger moths are the acrea tiger moth, the painted tiger moth, the vestal tiger moth, the spotted tiger moth, the ornate or Hewlitt’s tiger moth, Mexican tiger moth, the Edward’s glassy-wing tiger moth and the garden tiger moth. Put your caterpillar in a clear plastic jar or a small tank, with holes punched in the lid or a metal screen fastened on top. Put a twig or branch in the container, angling it diagonally to encourage the cocooning process. Once your caterpillar goes to sleep on the branch, you will need to provide a colder temperature for the metamorphosis to occur. The woolly bear can withstand very cold weather since it creates a unique natural antifreeze. Place the habitat outside in a sheltered area where you can watch it hibernate all winter. In the spring, around April or May, your caterpillar will become active again and begin to spin a silk cocoon. A week later, you will have a tiger moth you can release outdoors. Feed your woolly bear leaves from the plant you found the caterpillar on, refreshing daily. Isabella tiger moth larvae eat leaves of a variety of plants, shrubs and small trees. Edward’s glassy-wing tiger moth, which has beige or yellow feet, eats oak leaves. Mexican, ornate, painted and vestal tiger moths eat mustards, native shrubs or vines like wild cucumber vine, sunflowers and garden plants such as coral honeysuckle. The spotted tiger moth eats sycamore and willow leaves. The acrea tiger moth will eat almost any plants in a garden or field. Find out all you can about the species of woolly bear you're keeping to fine-tune your woolly bear's diet. A woolly bear caterpillar will hide under foliage during the day and become active at night. Keep some branches of leaves in a jar of water in the fridge, with a plastic bag covering the greens, for a ready supply of fresh feed. If natural your species of woolly bear's preferred food is unavailable, substitute iceberg lettuce. After the caterpillar starts to hibernate, remove leftover food, leaving only the twig in place. 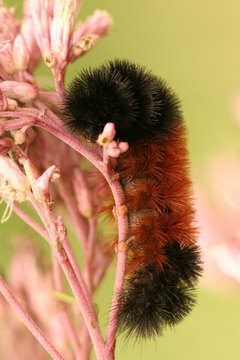 When the woolly bear wakes up in the spring, go back to feeding daily until the caterpillar cocoons. Your caterpillar doesn't need a bowl or dish of water to drink -- it would only pose a drowning hazard. Instead, mist the leaves or grass daily to provide water droplets for your woolly bear to drink. Discontinue once the caterpillar begins hibernation, and start again in the spring.